Ask Nic Allen about moving and he will agree with the majority who do not like doing it. 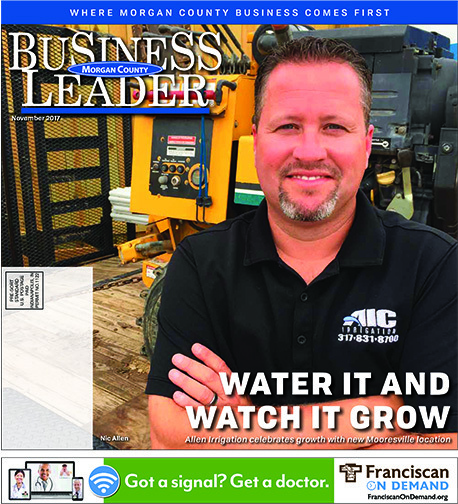 Then, in the next breath, he quickly adds that the recent move of Allen Irrigation Company to its new location on Monroe St. is a positive move well worth it in several ways. The 16-year-old business has always been in Mooresville, but this new home provides more space for staff and training, a place for remote irrigation operation technology, and garage space to maintain and repair equipment during the winter. He sees it as opportunity to grow his business. His start-up strategy was simple. Along with a friend who was in between jobs, he said they basically just knocked on doors and asked people to give them a shot. At the time he concentrated on all residential jobs because he could manage them. Like many others, Allen knew the work he would be doing, installing residential sprinkler systems. But that’s not all he needed. “I knew nothing about owning a business,” Allen admits. He said he felt he had the organizational skills that would be needed, and he had the tenacity to be a business owner. He also had the courage and acumen to realize something else. He said, “I feel I am able to recognize what I was good at, but getting to know what you aren’t good at is the important side.” That insight was one of the keys to his success. Wisely, he put great effort into focusing on the things that he was good at, and sought help to learn the other things. He went to government offices to get insight on payroll, taxes, and how to structure his business. When he got stumped, he asked another small business owner, an accountant, to help him figure out what he did not understand.